We’ve all been there – wounded and reeling after being mistreated by someone in our lives. No one is immune to being wronged; it happens in every relationship, sometimes intentional, often not. When people walk into my office, they often bring up painful memories of injustices and times when they’ve felt wronged by the people they love the most. Inevitably, the topic of forgiveness always comes up, and when it does, I always ask clients about what forgiveness means to them. Never has there been a time (at least so far), when anyone has really been able to answer the question. Forgiveness is one of those strange, mysterious topics for a lot of people – we think we understand it, until we really stop to think about it, and then we realize we don’t. Most people I’ve talked with don’t know how to define forgiveness. When people tell me, “oh, so-and-so really hurt me back then, but I forgave him/her,” and then we explore it and they ask themselves, and reflect on the subject, they come to realize that they really haven’t fully forgiven the person who wronged them. Or at least they aren’t quite sure if they actually have. I’ve come to realize that what most people mean when they make this statement is that they’ve made a cognitive decision or set an intention to forgive someone, or they’ve internalized the notion that they should forgive, but in reality, nothing’s really changed. In order to bring about the change people are seeking from forgiveness, it’s crucial to develop a real understanding of forgiveness. 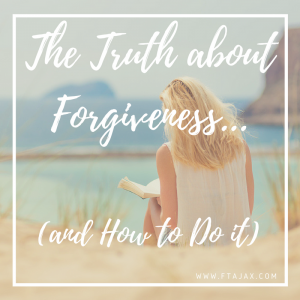 Below, I’ve listed some facts and cleared up some myths about forgiveness, in hopes that it will aid you in getting to a more peaceful place internally, and provide some guidance as you work to restore your relationships. “Forgive and forget” is a myth. Where did this phrase come from?! It is terrible advice. Most people lump the two together, and assume that they go hand in hand. They do not. Yes, “forgive and move on” may be good advice – as in, if you truly have forgiven someone, quit holding their offense over their head. Move forward in your life. Let go of your status as a “victim.” However, forgetting that the offense occurred is a) impossible, and b) unwise. Think of it this way: if you’d invited a person into your home and they robbed you, you may decide to forgive them, thus not requiring them to pay back the things they’ve stolen; yet, you probably (and wisely so) would not agree to let them into your home again! Forgiveness does NOT mean that trust has been restored. Forgiveness and reconciliation are two very different things. Sometimes, trust can be restored, and the broken relationship can be repaired. Working through this process can even make a relationship stronger that it originally was. Other times, the injuring party is simply not safe enough to reconcile with (e.g., they have no remorse and/or are unable to stop the damaging/unjust behavior), and it’s in your best interest to end the relationship. Nobody can force you to forgive someone. I think back to my childhood, and the well-meaning adults in my life who would tell us (myself and whoever I happened to not be getting along with – usually my sister), “Now, you need to forgive each other.” It was not a suggestion; it was a command. Forgiveness, if it’s to be authentic, needs to be a freely-made choice. If it’s coerced, it, by nature, isn’t really forgiveness. You can say you’ve forgiven that person in order to appease those commanding you to do so, but if, inside, you’re carrying bitterness and ill-will, then the words are meaningless. In fact, commanding someone to forgive can be quite damaging. It robs the wounded party the opportunity to truly work through their pain and resentment, setting the stage for future problems to grow out of the original offense. It’s like trying to kill a dandelion by ripping it off at the stem. The roots continue to grow deeper and spread wider, and at the very least, another dandelion is going to crop up in its place. It takes a moment to decide to forgive someone. However, it takes longer to truly let go of the anger, resentment, and hurt. I had a friend once who I felt had wronged me very badly. Immediately, I decided I would forgive this person. For me, this meant choosing to start walking down the road of forgiveness. The process took months. Occasionally, for whatever reason, my husband would bring up this person’s name in conversation, and I would instantly become upset. I had a hard time wishing this person well, because I didn’t think she deserved it. He’d tell me that I hadn’t forgiven the person, but I felt like that wasn’t quite accurate. I knew that I was on the journey, committed to letting go of my resentment, but it was going to take time. Eventually, I came to realize that at some point, I had, indeed, fully forgiven her. I was able think about and talk about her without any of those old feelings that used to be so intense. More importantly, I could wish her well in life, wanting the best for her, regardless of the fact that she hadn’t apologized or tried to make it up to me in any way. I hope this information brings some clarity to the subject of forgiveness for you. Regardless of having this cognitive understanding of forgiveness, the process can be very complex and difficult, especially if you’re trying to decide whether or not to work to repair a broken relationship marred by distrust and painful wounds, or you’ve made the decision to try to reconcile, and the problem is too much to try to resolve on your own. You don’t have to go through this process alone. We would be honored to walk alongside you on this journey – call or schedule now.